What is expected to be one of the biggest trials of the past 30 years got under way in Preston today. A jury for the trial of the Hillsborough match commander David Duckenfield is expected to be selected on Tuesday after 68 potential jurors were excused. 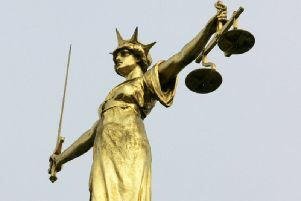 A jury panel of 100 completed questionnaires which asked about their football allegiances and connections to the police as the 74-year-old former chief superintendent appeared at Preston Crown Court for the start of proceedings on Monday. Duckenfield, of Bournemouth, sat in the well of the court alongside solicitors and former Sheffield Wednesday club secretary Graham Mackrell, 69 - who is charged with contravening the stadium's safety certificate and a health and safety offence. The retired South Yorkshire Police officer, who wore a black suit with a checked shirt and blue tie, denies the gross negligence manslaughter of 95 Liverpool supporters at the 1989 FA Cup semi-final. When the hearing began shortly after 11am, the 100 potential jurors were brought into the courtroom - sitting in the jury box, public gallery and dock. Judge Sir Peter Openshaw told the jury panel: "Public opinion in this country strongly supports a system of trial by jury, particularly in serious cases. "I know that your jury summons suggests that jury service is usually only for two weeks, but some trials take longer than two weeks and I must find a jury, if I can, to try an important case which might last three or even four months." The questionnaire, which was given to assess whether they were suitable to serve, said: "In this case one defendant is charged with manslaughter and another with two health and safety offences arising out of the Hillsborough stadium disaster at the FA Cup semi-final between Liverpool and Nottingham Forest played in Sheffield as long ago as April 15 1989." The form was made up of 18 questions including whether they were supporters of Liverpool, Everton, Sheffield Wednesday or Nottingham Forest football clubs and whether they or close family members or friends had ever been police officers or been employed by the police, Crown Prosecution Service, Independent Police Complaints Commission or any criminal justice agency. The two defendants were asked to stand so the panel could see whether they recognised them and a list of witnesses to be called was read out. Potential jurors were also asked whether they had health problems or had any pre-booked holidays while the trial was due to sit. Sir Peter said: "Don't go out and book a holiday this afternoon." He also warned them not to look up anything about the disaster on the internet. Sixty-eight of the panel were excused from serving on the jury after completing the questionnaire. Sir Peter told the remaining 32 he would allow them to reflect on their positions overnight and they would be able to make any further submissions on Tuesday morning if necessary, before the jury was selected by ballot. More than 20 of the victims' family members sat in the public gallery of the court, while others were able to watch the hearing on screen from a court annexe and at the Cunard building in Liverpool. Duckenfield previously appeared via videolink to enter a not guilty plea to the charge of gross negligence manslaughter. Ninety-six men, women and children died in the crush in pens at the Leppings Lane end of the Sheffield Wednesday ground at the match between Liverpool and Nottingham Forest.